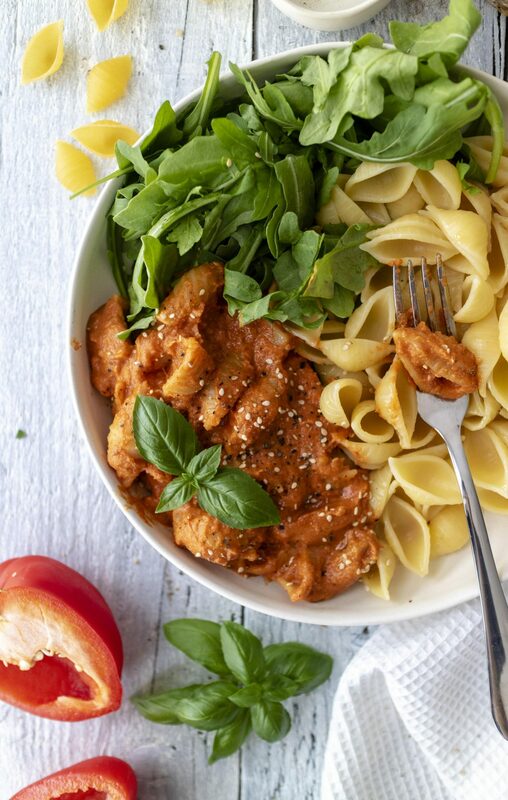 There’s nothing more divine than a homemade Roasted Red Pepper Pasta sauce, right? I love experimenting with different ingredients, and in fact, this recipe also started as an experiment and an overflow of sweet red peppers in the fridge from a recent photo shoot. So I decided to use them up in the best possible way: with Roasted Red Pepper Pasta! Now, I’ve seen people roast peppers on the gas stove on the open flame. Myself, I don’t have a gas stove however, so for me that endeavour would be a little difficult. Instead I always roast my peppers in the oven – I simply wash and brush them clean, remove the stem and chop them out roughly, drizzle with a little oil and off into the oven! With this method the skin remains on the peppers, which I absolutely don’t mind, as my high speed blender can get through it quite easily. If you however prefer to remove the skins upfront, make sure to grill the peppers in the top of the oven as a whole until the skin cracks. Carefully remove the skin from the peppers, then chop and de-stem. 2. Wash your peppers, then remove the stems and chop them roughly. 3. Transfer the chopped peppers to a baking tray, brush them with Extra Virgin Olive Oil & sprinkle a pinch of salt across – then put them in the oven on a medium level and roast the peppers until the skin begins to crack. 4. Add the roasted peppers to a high-speed blender together with the tomato puree, stock and nutritional yeast and blend until you receive a smooth paste. 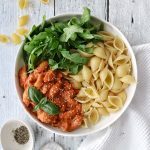 When trying to find the right pasta, I always look at how well the Roasted Red Pepper Pasta holds the sauce. Pasta with ridges and little ‘pockets’ always holds sauce better than smooth pasta and in this case, the sauce needs to be well-held in order to bring out the full flavour of the dish. I would recommend using Conchiglie (like I did in the picture here!) or Fusilli, which are masters at holding sauce well.